With a sculptural and monolithic silhouette, Bay is a collection of outdoor furniture with a woven frame. 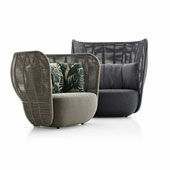 The wrap-around interwoven volumes are combined with padded seats in the shape of rocks and soft cushions that give elegance, comfort and sophistication. The armchair has an internal aluminium structure and polyurethane foam padding, with a water-repellent polyester fibre cover. Polypropylene fibre braid and cushions covered with water-repellent fabric. The Bay family of seats was extended in 2019 with three new elements: a sofa with a deep seat completed by new roller cushions, a small armchair and a pouf. Dimensions and materials refer to product in the image. To know if other styles are available, contact one of the stores which subscribe to Designbest or request information via the relevant form. 50 candles for B&B Italia! Tufty Time by B&B Italia: this cult sofa is ten years old!